Re: WHO WILL BE GROWING WINTER TOMATOES INSIDE THIS YEAR? I honestly don't know how you guys do not get sick of growing tomatoes. In my garden by the time I yank them I am so sick of them. Right about now I start to want to plant them again and by the time to plant them I can not wait. I would not be able to grow them all year long. We -- or at least *I* am weak. Cannot take the deprivation until planting time -- seed starting for summer tomatoes isn't until mid Feb at earliest, and actual planting not until late April/early May. ...can't wait to take a pic of the ripening fruit and show you all. Looking good I can almost taste it. It's about 1" across viewed this way but it's actually elliptical and is more like 1-3/4" at widest. Once this is harvested, the larger fruit which is about 2" across at widest should color break and blush. In the garden at maximum growth (28-30" high) some Kootenai fruits got to be maybe 2-1/2" in diameter so there isn't a whole lot of fruit size reduction in the container so far, and this is still a very small plant. I cant wait for mine to be ready! Forgot to mention I have some ripe fruit as well. JA Yellow X Hippie Zebra F2 first ripe winter tomato. Pics to follow. 1st to ripen red Kootenai with what should have been Coyote -- these turned out considerably darker yellow and larger than the summer fruits so maybe it was bee crossed -- Jaune FlammÃ©e was the only yellow nearby and that would have been the right color and could account for the increased size? Last edited by applestar on Wed Dec 11, 2013 3:23 am, edited 1 time in total. Beautiful! It is just amazing to me that you can grow all that indoors, in winter, without high intensity lights or any really fancy equipment. I'm still not trying it. Pretty much all available window space is taken up with all my house plants and all the ornamentals that get over-wintered. That's even more true right now, because the best window space with an almost floor to ceiling picture window facing mostly west and 2 windows on the other wall of the corner, facing mostly south, is now taken up with the Christmas tree. All the plants and trees that were there have been relegated to other (less light) spaces. ...I dunno... This is more fun --- and you get to eat them, too. Last edited by applestar on Wed Dec 11, 2013 3:29 am, edited 3 times in total. My apologies ahead of time if you have already answered this, as I haven't read the whole thread, but that looks to be a dwarf growing with the rugose dark green foliage. What variety is it please? Just curious because this is my first year growing dwarfs, and they are impressive. Just wanted to follow up and say that my growing is doing quite well and I have a number of cherry tomatoes on and getting bigger. My only concern at this point is since my growing area is in the unfinished basement, the recent cold snap outside is really putting a damper on the temp. Right now I am only averaging a high of like 70 to 72 and the low goes down to about 59 with the lights off. The family room where winter wonderland is was only 56Â°F this morning and The cool gang on the floor is still sitting at 57Â°F. I think your 70's high and 50's low would not keep them from blooming and fruiting as long as you are diligent about e. toothbrushing the blossoms. Mine will be very slow to ripen. applestar wrote: The family room where winter wonderland is was only 56Â°F this morning and The cool gang on the floor is still sitting at 57Â°F. I think your 70's high and 50's low would not keep them from blooming and fruiting as long as you are diligent about e. toothbrushing the blossoms. The upstairs fruit is ripening red and with the already present striping, it looks like this was a Tigerella and not Jaune FlammÃ©e as I thought. This first fruit is about 17 inches up the vine -- maybe typical for an indeterminate and a trait that may be unsuitable for my criteria. Anyone else growing winter Tomatoes in FL, how's it going? 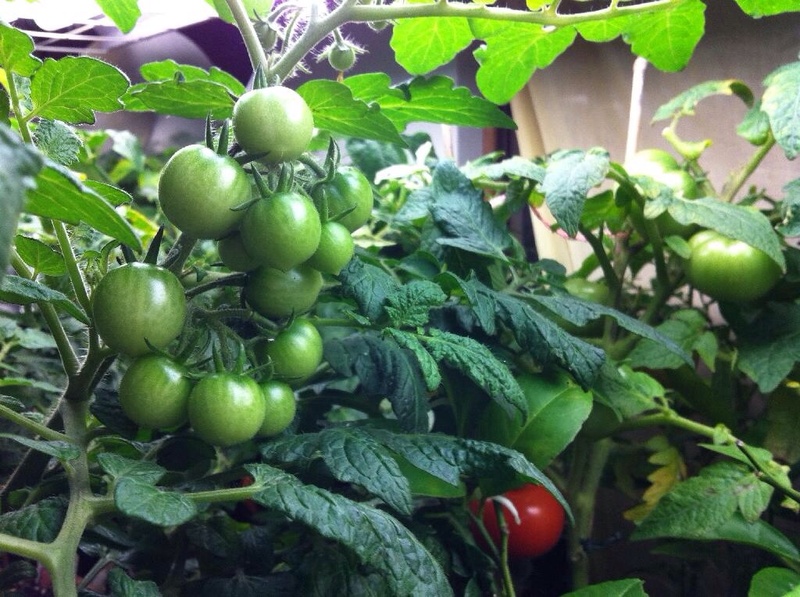 Anyone growing tomatoes indoors this winter?